A boisterous crocodile does not want to get dressed in the morning. Alfie is not even going to school but to the park to play with badger pal Bert. 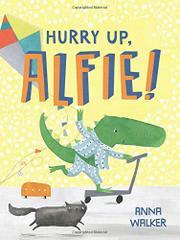 Even so, Alfie cannot get ready on time. There are too many other important things to do. Such as swing from the doorframe, practice headstands, pretend to be a zombie, or zoom down the hall on the scooter. Alfie’s parent is very patient (though italicized words—“You’re supposed to be getting ready!”—suggest understandable frustration). When Alfie finally is dressed, the little saurian ends up disrobing in the park anyway to play in the water. Walker (Peggy, 2015) sets this broad-nosed, lollygagging croc against beautifully patterned backdrops rendered in ink and collage. The delicate illustrations sweeten the tone of an oft-told morning struggle. Offered in a simultaneous publication with Alfie’s Lost Sharkie, about the search for a stuffed animal before bedtime, the book proves that Walker knows typical toddler foibles all too well. In both books, both parent and child croc are dressed ambiguously enough to be either male or female, and the text is 100-percent dialogue, allowing readers to choose genders as they see fit.